Having just bought a condo in Toronto, plus wedding season, and also my burgeoning Faberge egg collection, really takes a chunk out of the ol' pocket book. BUT, I do want one of them zoomy dealies. One day. so... you're getting married? or are you spending $$ on wedding gifts? Reverb/delay/modulation FX of all flavours are a no-brainer with keyboards, but running them into guitar amps can have unexpected results too; I thought my Farfisa Compact needed one of its voices tweaked till I realised the dissonant overtones on the highest notes were coming from my Epiphone Jr. Unlike guitar, micing up keyboards through amps is under-rated! 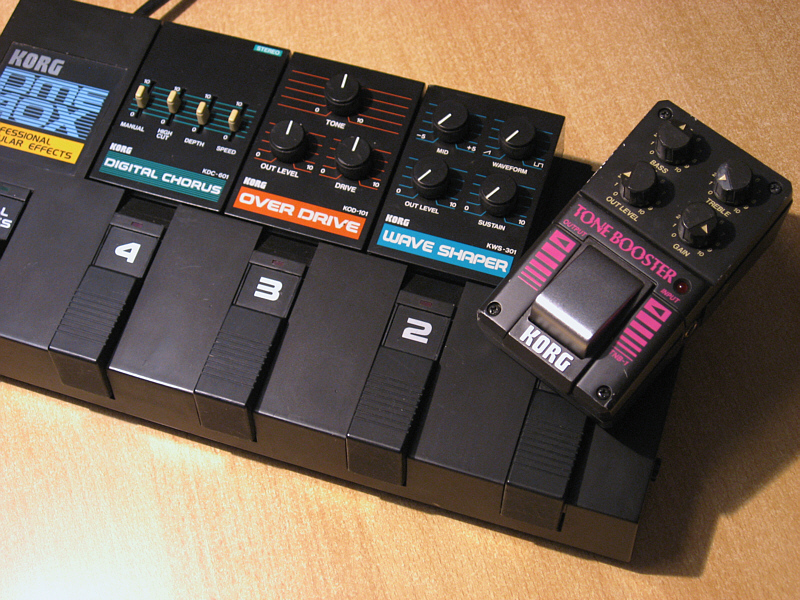 Among my favourite keyboard pedals is my humble Schaller Tremolo, the best tremolo I own. I have a Catalinbread Repeat Percussion tremolo that sounds good (and totally unlike 'normal' tremolo) with keyboards too. If you have an amp with tremolo, it's worth plugging your keyboard into it as an experiment if nothing else. One of the best sounds I've ever been able to coax out of a keyboard was sending one of the 'elec. guitar' sounds (I think; could've been one of the harp sounds) from my Casiotone 202 into a Throbak Strange Master, into DOD FX96 Echo - the result was the kind of radiophonic/'60s soundtrack sizzling pseudo-harpsichord melody that haunts my reverie. As someone else said, anything goes. Got an FX pedal? Put a keyboard through it. What's the worst that could happen? P.S. I'm now craving one of those Zoom MS-70CDRs. Oh, no, I'll die alone. Everyone else is getting married! I like the Ibanez AD80 on synth but I recently saw Hannah Peel using hers on her stage piano to give a sort of gliding warble but live I'm sure she has two, one for the synths and one for the Nord. Very cool David. What does the waveform shaper do exactly?? The retrofuturism aesthetic at its best... although when somethign's just pretty old, it's just futurism? but from the past? Strange square wave kinda fuzz/filter that makes expensive synths sound like late 70's/ early 80's tape only bedroom industrial track. I don't know if they all do it but mine sometimes randomly acts like a blocked carburettor where it's sort of splutters and stalls before clearing itself. Also does a weird mewling thing but I mainly like it for the name. Next time I'm home I'll take some pics of mine. Yeah recreations like tha tnaff JHS Pedal for that Ryan Adams always look rum. Is anyone using a Zoom G3 for synths? Is it cool? Well, it's got a lot of the same patches as the MS70, doesn't it? Seems like a promising notion. I love my Boss Tera Echo with synths. Red Panda Particle and Montreal Assembly Count to Five are also wonderful with synths.